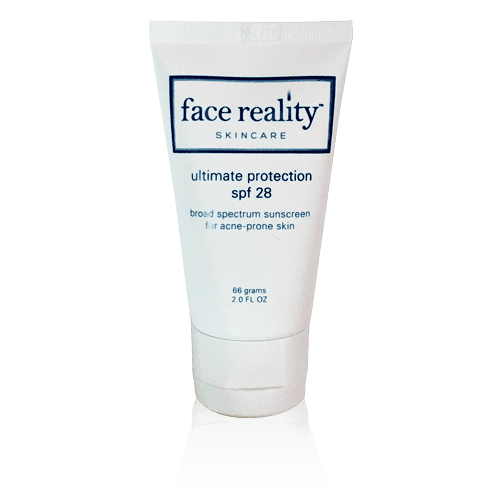 Face Reality Ultimate Protection SPF 28 is a physical sunblock that contains both Zinc Oxide and Titanium Dioxide. This broad spectrum sunscreen provides UVA and UVB protection without causing the skin to turn white. Most importantly, this sunscreen is guaranteed to not clog your pores and cause acne. Allantoin helps to soothe and moisturize the skin. Tip: Sunscreen will help your skin heal post inflammatory hyperpigmentation, which are the red marks left behind after an active blemish heals by preventing further melanin stimulation and damage to the area. Best for acne-prone normal, dry and sensitive skin types.